Today the choices of shingles for your roof can seem to be a bit overwhelming. Not just for the style and design of the roof but the actually quality and construction of the shingle. When you’re getting a new roof in Livingston Michigan understanding your choices when it comes to the shingles that will be installed can help you make a better choice for your roofing. 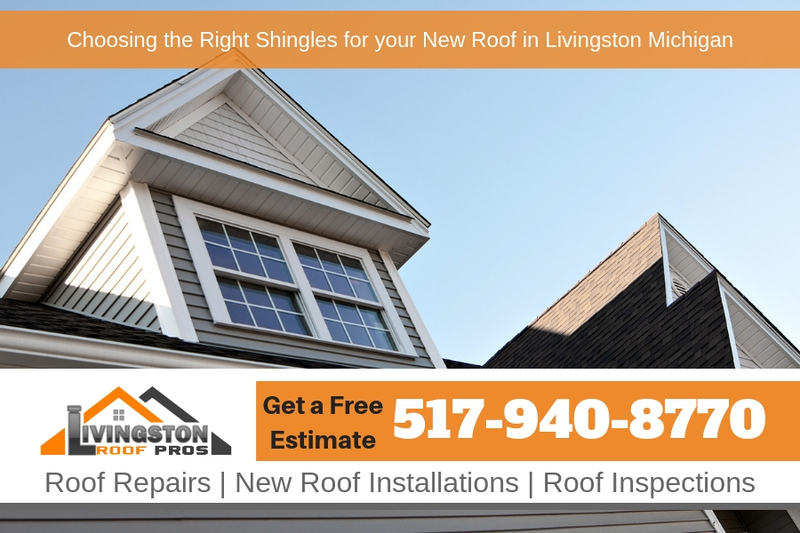 At Livingston Roof Pros we can help you choose the perfect shingles for your home. Listed below is more information about the roofing shingles we offer and can install for you on your Livingston Michigan home. It isn’t every day that you completely replace the roof of your home. In fact, this isn’t something you do more than once a decade, usually. This being said, you want to make sure you are making the right choices in material when you do take on this magnitude of a project. You want to make sure the shingles you choose are a good quality, style, and design for your home. You’ll have to decide on the type of shingles you want first. There are several options that you could choose from. Laminate, cedar shakes, or asphalt shingles are all options you could go with. It is important to understand the differences between the different options so that you make the best choice for your roof. Asphalt shingles in particular have two very popular types of shingles that are important to understand the difference between. The popular 3-tab shingles, also known as ‘regular’ shingles, are flat and uniform in shape and size. These are lightweight and comparable in price to laminate shingles, but tend to be less durable with a shorter lifespan. Laminate shingles, sometimes referred to as architectural shingles, are also asphalt shingles but are made of heavier duty material and are layered thicker than your 3 tab shingle. These are available in a variety of shapes and sizes, so this option provides varying design options as well as durability. Most projects will be more geared towards laminate shingles due to their variety and longer lifespan. There are three major elements of your shingles that you need to consider when choosing for the replacement of your roof: Style, Defense against Algae, and Fire Resistance. A great combination of these three areas will be your best roofing option. Style – Obviously you want the appearance of your roof to work well aesthetically with the rest of your house. Architectural shingles provide a dimensional effect with the shadows created by the shape and design. Various shingle designs are available for unique looks. You’ll also want to consider the color options that are available in the style you choose. While you want to choose something you like and that works with your home, you need to think about the neighborhood aesthetics and curb appeal as well. You don’t want to choose something that sticks out like a sore thumb, or something that could prevent you from potentially selling your home in the future. Defense against algae – While this could be climate dependent, there are shingle options available that help in the fight against algae growth. Look for shingles with special guards built in that keep them from becoming discolored if you live in an area prone to algal growth. Fire Resistance – This factor shouldn’t even be a second thought. Make sure that your shingles meet the standard minimum requirements for fire safety to ensure your home and family is protected from fire. You can also get a discount on most home owners insurance with these shingles on your home. Be sure to ask your insurance agent for details. As with any project, you’ll need to consider other factors specific to your home, community, and climate. Just like coastal areas may need to be equipped with sturdier shingles to defend the roof against gusty winds places like Livingston Michigan needs to protect against ice and snow. Be sure to call Livingston Roof Pros today for more details and to get a free estimate on a new roof for your home.